The entities in Quake III Arena are limited to those defined by the game code. The editor can draws entity information from the game code, or from special definition (.def) files. Version 192 of the editor comes with a .def file developed from an original supplied by EutecTic. Mods made to Quake III Arena can add to and/or subtract from the entities used by a game. If you plan to work on mods, you should create multiple project files (copy and rename your project file) with the changes required for the mod. You make game design decisions about entities and modify their features within the Entity Window. The definition file that you select on the Project Settings… window determines what entities will be shown in the Entity List and what, if any, property descriptions appear in the Key Descriptions and Check box Spawn Flags. The Entity List is the field on the Entity Window. It contains the "classnames" of all the entities defined by the definition file in alphabetical order. You can use the scroll bar to scroll through the entities or, after clicking on the field, type in the first letter of the class you want to use (e.g. ; type in "T" to select "target", or "A" for ammo, "W" for weapon). Double-click on the classname to select it and enter it on the first line of the Active Properties field. The Entities appendices of this document contain a complete listing of all the entities used in Quake III Arena. The entries in the Key Description field are the "rules of use" for the hi-lighted classname in the Entity List field. You can use the scroll bar to scroll up and down through the lines, but the entries are not interactive. If you are using the .def file accompanying release version 192 of the editor (or Eutectic's original), all the key commands are described and their acceptable values (or value ranges) are listed. If you are using the descriptions in the .c game code file, they may be substantially less descriptive. Spawn flags are properties assigned to entities by use of check boxes. Check the box to set the feature for the selected entity. Many entities have only a single spawn flag property, while others have numerous ones. 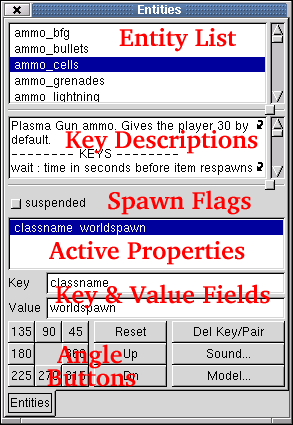 Note that the check boxes to the right are only relevant for Quake 2 single player games and will not work for Quake III Arena. This field shows all the properties currently assigned to the selected (or newly-created) entity. Each property has two parts: key and value. Once created or assigned, they appear on the same line together. Only properties that are valid for an entity (that is, ones that appear in the Key Descriptions field) will function in game. Adding others may create error messages. You cannot directly affect the properties in this field. Clicking on an active property hi-lights it and fills in the key and value fields below. You can edit both the key and the value in those fields, or use the Del Key/Pair button to delete it altogether. Keys (and their values) are assigned to entities by typing them into the fields. There is no spell check or auto-correction, so make sure that your typing is accurate. Start by typing in the name of the key. Then hit TAB or ENTER to change to the value field. This also clears the contents of the value field. Now type in the value for the key (the Key Descriptions list the acceptable value ranges for the keys). If you hit ENTER, the key and value appear in the Active Properties field. If you hit TAB, the cursor moves up to the key field. You can also click directly on a field to edit it. The cursor will appear after the last character in the field. Use arrow keys to position the cursor within the field. The Angle Buttons (below the value field) are used to assign a facing direction (as is the case with player start spots or misc_models) or movement direction to entities (such as doors and buttons). Click on a button to create an Angle key with that button's value in the Active Properties field. Clicking on another key changes the angle value. There are two clusters of angle buttons. The first cluster represents rotation around the Z-axis for entities like player start or spawn spots or misc_models. The entity will face in the selected direction. The buttons represent angle directions in 45 degree increments. There is a direct correspondance between the angle that the entity will face (or move) and the position of the button in the cluster. If you select the 90-degree button at the top center of the cluster, the entity will face "up" on the XY 2D Map. If you select the 180-degree button on the left side of the cluster, the entity will face left on the XY 2D Map. For entities like doors or buttons, it represents the direction that entity will move when activated. The second angle button cluster assigns an up (-1) or down (-2) direction to the entity. Note that an entity can only have one facing direction. It cannot face up and 45 degrees. It can only affect one or the other. It is also possible to directly edit the angle value in the value field. This allows for a much more precise angle selection. A third cluster of buttons sits to the right of the Angle buttons. Each has a unique function. Clicking on this button will reset all properties from the entity to the default values. If you have selected an active property, clicking on this button will delete the property. This opens a Windows directory browser in the directory that contains the map sounds. Double clicking on a sound file name in the browser window creates an active property with the appropriate key and the value as the path/name for that sound. This opens a Windows directory browser in the models/mapobjects directory. Double clicking on an .md3 file name in the browser window creates classname misc_model active property with the value as the path/name for that model. These tools manipulate the in game entities. The map component handling tools that are described in the Working with Brushes section also work with entities. This is the all-purpose deselect key. Use it to back out of operations you don't want to complete or to stop working on an entity. Hi-light the acting entity (usually a trigger, or a button). Hi-light the targeted entity (examples: target_position, target_relay, a door). Select Connect Entities (or press CTRL + k). A path is drawn between the two entities. The first entity selected always targets on the second. Are both objects already entities? Sometimes it's easy to forget to make a trigger brush into a trigger. Did you select ONLY two objects? If you accidentally click on something you don't intend to link, you have to start the linkage over. Did you select the objects in the correct order? Is the second object something that can be triggered remotely? This unbinds an entity made of brushes, and/or patches, and md2 models back into separate map components. Once ungrouped, the entity is no longer an entity and loses any and all key value properties it may have had. Design Note: If you intend to rebuild an entity after ungrouping it, write down its key properties and values first. These keys move the Entity around the map in discrete map grid increments. These keys move the Entity around the map in discrete map grid increments. The movement is in terms of the selected window, not in terms of XYZ coordinates. To change the direction that a misc_model or entity with a facing (such as a player start or spawn spot) faces, use Angle keys and values. You should "rotate" (change facing) entities with either the Angle buttons on the Entity Window or by entering an Angle key and giving it a rotation value between 1 and 360 (inclusive).